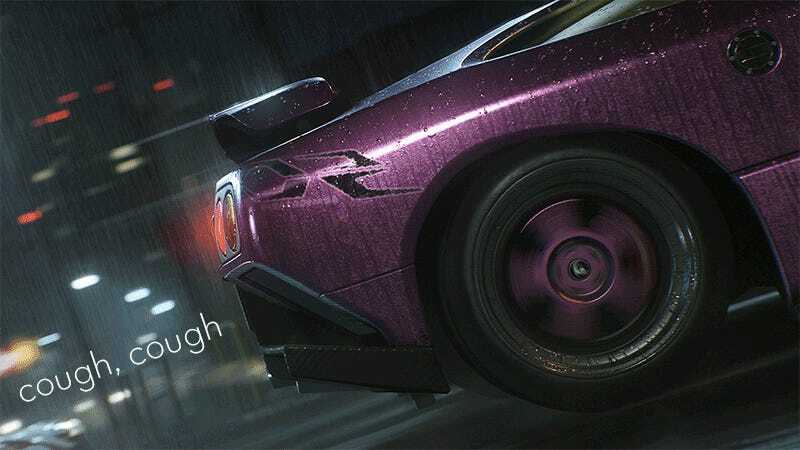 There are several aspects of EA and Ghost Games’ dark and rainy Need for Speed reboot that I enjoy immensely. Due to regular gameplay hiccups, racing just doesn’t happen to be one of them. Releasing tomorrow on Xbox One and PlayStation 4 and later on for the PC, the new Need for Speed is a bit of a throwback in terms of style and strategy, mixing modern ideas like large open worlds and online multiplayer free-roaming with a story told through charming full motion video cutscenes and the idea of transforming a single vehicle into a racing powerhouse rather than tossing it the moment you can afford something faster. It’s those two older ideas I admire the most about new Need for Speed. At first the FMV struck me as a bit corny, but then I embraced its corniness and started wishing there were more of it. It’s the friendliest illegal street racing gang ever, featuring a mechanic, a drift expert, a lovable goof and the man whose hairstyle I would steal if I still had hair to style. I miss these guys when they aren’t around. Sure, they’ll all ring me up on my phone incessantly while I am roaming about the streets of Ventura Bay, begging me to drive all the way across the massive map in order to lose a race to cheap AI, but I feel the same way about them as I do most real people—they’re fun in person, but stop calling me. My favorite character so far however, is my 2004 Acura RSX-S. It was a rocky relationship at first, what with the stock version of the car racing about as well as a rental car, but upgrade a few parts, drop the tire pressure in the rear wheels and loosen the hand brake and my ugly salmon-and-purple vehicle became a drifting machine. Well, more a drifting/crashing machine. The streets of Ventura Bay are always dark—we are racing illegally after all—and most of the time wet. These are not optimal racing conditions, and they cannot be changed. The darkness coupled with a default camera angle that feels far too low make for a lot of crashes. I’d plow through obstacles I couldn’t see a moment before. Ventura’s open roads branch wildly at times, and without a clear view of racing guides I found myself veering wildly off-course during many races, missing an off-ramp and loosing any advantage over the wildly rubberbanding AI racers I might have had. Looks like the video stutters, doesn’t it? It did not. That’s the game. At regular intervals the action will hiccup, stutter, call it what you will. It might seem like a small thing, but when you’re setting up for a drift around a tight corner and that happens, you’re hitting the wall. It completely throws off the rhythm of the race. Here’s an entire event. The first stutter kicks in around the :25 mark. Then again at around 1:25. Then 2:25. It even happens on the results screen at around 3:25. I don’t know why it’s happening, but it’s done it now on two different Xbox One consoles, both racing online in a group and in a solo game by myself. I’ve read a few other previews for the game that mention the jitters on Xbox One, while the PlayStation 4 version seems just fine, maintaining a steady 30 frames per second throughout. Hopefully it’s an easy fix for EA and Ghost, as it’s ruining an otherwise compelling single-player experience. I stress single-player because so far, despite raving on a map with several other online drivers, my interaction has been limited to passing or crashing into them and then moving on. I’ll put in some more time with Need for Speed tomorrow when the game launches and the servers fill with eager racers to see how the game’s multiplayer holds up. To contact the author of this post pull up to him at a stop sign, write to fahey@kotaku.com or find him on Twitter @bunnyspatial.